MANNING, Ore. — A 19-year-old man told investigators he caused a three-car crash when he fainted while holding his breath as he drove through a tunnel northwest of Portland, Oregon State Police said. Daniel J. Calhon, of Snohomish, Washington, told investigators he fainted Sunday afternoon while holding his breath in the Highway 26 tunnel near the community of Manning, according to a news release. His car, a 1990 Toyota Camry, drifted across the centerline and crashed head-on with a Ford Explorer. 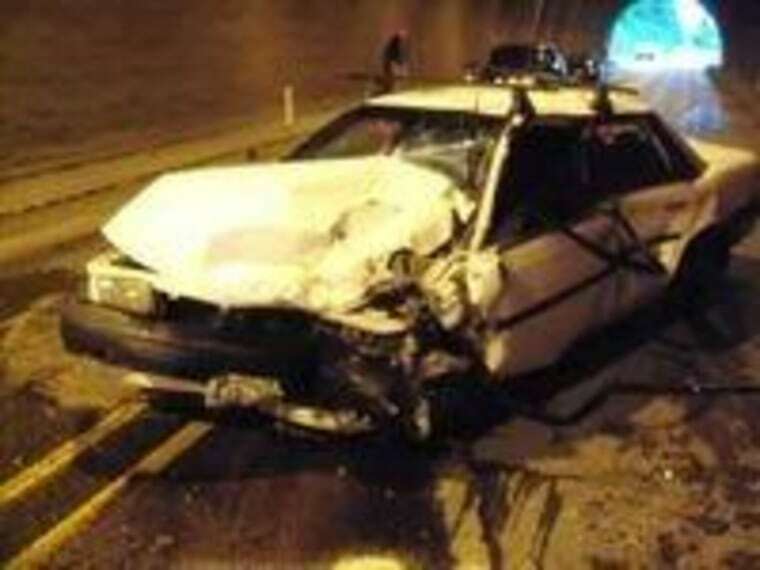 Both vehicles struck the tunnel walls before a pickup hit the Camry. Calhon and his passenger, 19-year-old Bradley Meyring, of Edmonds, Washington, suffered non-life-threatening injuries, as did the two people in the Explorer: Thomas Hatch Jr., 67, and Candace Hatch, 61, from Astoria. All four were taken to hospitals. The two people in the pickup truck were not hurt. Calhon was cited for reckless driving, three counts of reckless endangerment and fourth-degree assault in Washington County Circuit Court. It was not clear if he had a lawyer. State Police Lt. Gregg Hastings said Monday he's not sure why Calhon was holding his breath, but some people hold their breaths in tunnels as part of a game or superstition. Some people do the same when they drive past cemeteries. The tunnel, called the Dennis L. Edwards Tunnel, was completed in 1940 and carries Highway 26 through the Northern Oregon Coast Range mountains. It's 772 feet long, meaning that a car traveling at the posted speed limit of 55 mph would get through it in about 10 seconds. Hastings told The Oregonian newspaper investigators do not believe drugs or alcohol played a role in the crash. "It is odd," he said.